Wildlife tour Odisha with Sandpebbles – A scenic experience with nature, Flaura and Fauna of Odisha. Looking for a genuine wildlife getaway? Wildlife Tours Odisha is your ultimate destination to visit! Though the beaches and temples take the baton home for their popularity, the Wildlife Tours Odisha is amazing to experience. 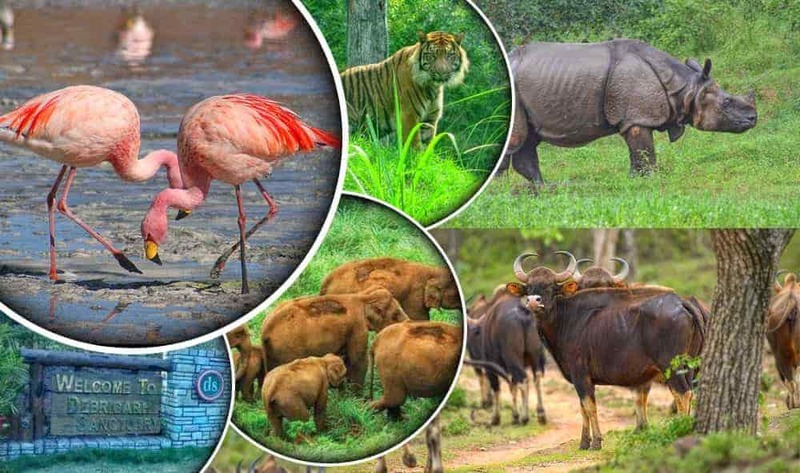 With a bunch of national parks, tiger reserves, and wildlife sanctuaries, the state has cosseted enthralling species of fauna and flora that you won’t find anywhere else in the world. Be it the Mangrove Forests & Wetland of Bhitarkanika or the forests of Chandaka, every nook and cranny of the eastern Indian state embraces rich wildlife. On your Wildlife Tours Odisha , you get a chance to see animals roam around in their untouched habitat, listen to their sounds and feel your heartbeat rise with excitement. Here, you can witness hundreds of diverse genus of creatures encompassing tiger, elephant, crocodile, deer, jackal, and many more in their natural habitat. Our Wildlife Tours Odisha package is tailored to your interests and offer an opportunity to see the best of wildlife that the state has to offer. Arrival at Bhubaneswar Airport / Railway Station and transfer to hotel. Afternoon visit to Lingaraj temple, Khandagiri Udayagiri Jain Caves. Evening free at Ekamra Haat Dinner and Overnight at Bhubaneswar. After breakfast visit to Satkosia via Angul. Take the boat cruise at Satkosia Gorge where you can come across plenty of Mugger and Gharial along the sand banks. Afternoon trekking along the nature’s trail. Dinner and Overnight at Satkosia. After breakfast visit to Bhitarkanika. Check-in to our Resort .After a delicious home style lunch cruise to Kalibhanja Diha Island on countryside boat approved by Wildlife Department, to enjoy panoramic view of Ramsar site. Evening visit the Jagannath temple to participate in the Live Aalati Darshan. In the evening enjoy the campfire with Snacks and Dinner. Overnight at Sand Pebbles Jungle Resorts. After a delicious home style breakfast, visit to Bird sanctuary, trekking to hunting tower of Ancient King, cruise to different creeks on countryside boat approved by Wildlife Department, to spot crocodiles. After lunch visit to museum and project area. In evening enjoy the camp fire with Snacks and Dinner. Overnight at Sand Pebbles Jungle Resorts. After a delicious home style breakfast visit to Similipal Tiger Reserve. Check-in to hotel. After lunch nature walk and nature study at herbal nursery, visit to Crocodile breeding farm. Dinner and overnight at Similipal. After breakfast visit to Barehipani and Joranda Waterfalls and Jungle Safari. Then visit to Chahala Zone. Dinner and overnight at Similipal.